Our beloved cherry tree is slowly dying. Every year a few more limbs need to be cut off. Recently my youngest son, earning a trip abroad by doing odd jobs, was sawing off some diseased limbs. Inside one he found an intriguing hollow and excitedly brought it to my attention, exclaiming I should use it as a sculptural vessel for plants. He is, after all, his mother’s son! 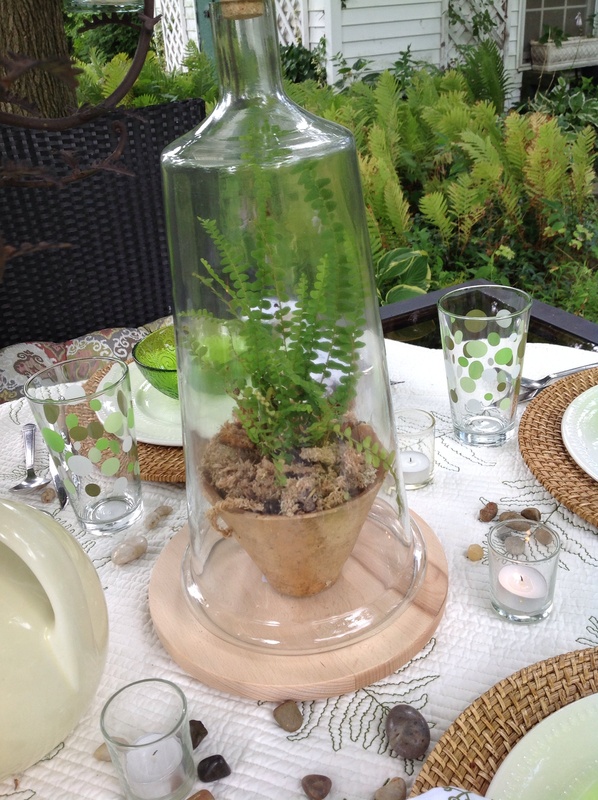 The creative wheels began turning and I envisioned a mini woodland garden nestled inside nature’s vessel. 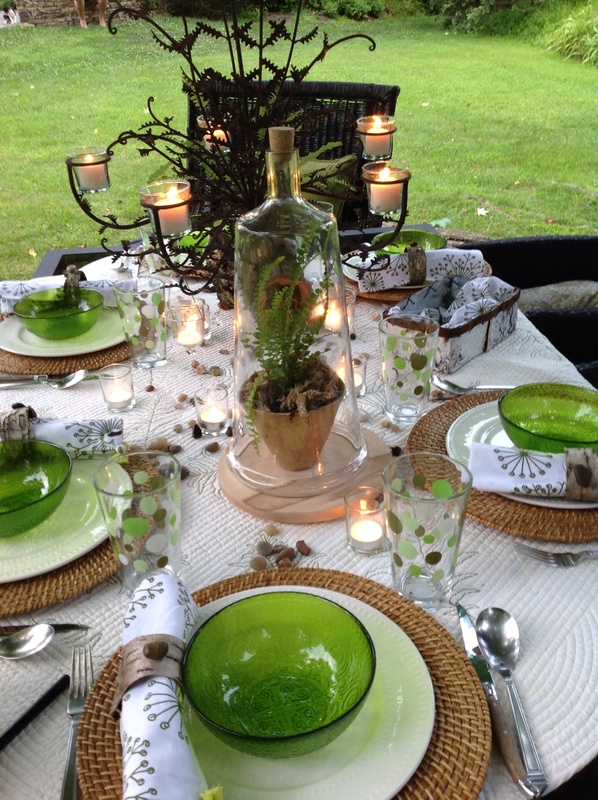 So was born the inspiration piece for this table setting. 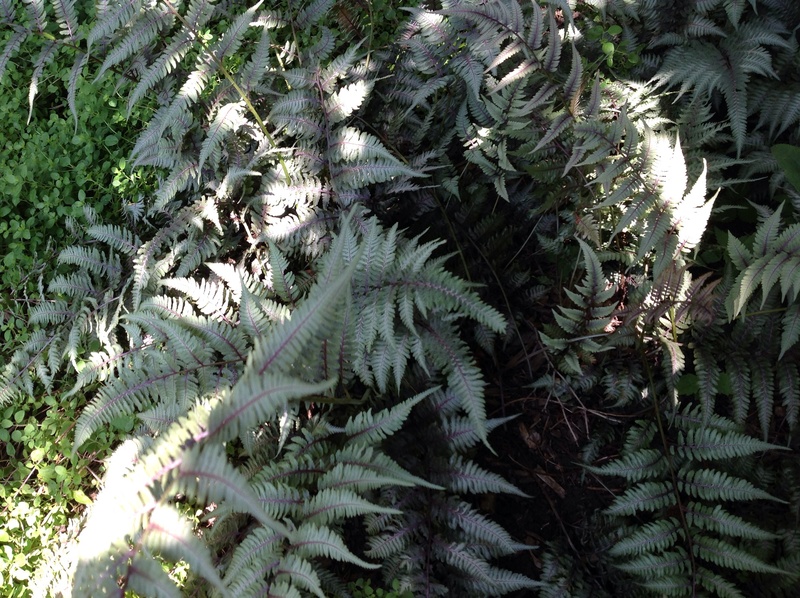 In summer, our back yard is an oasis of ferns in a multitude of shades of greens, purples and silvers that sway in the breeze and cast a beguiling invitation into the garden. 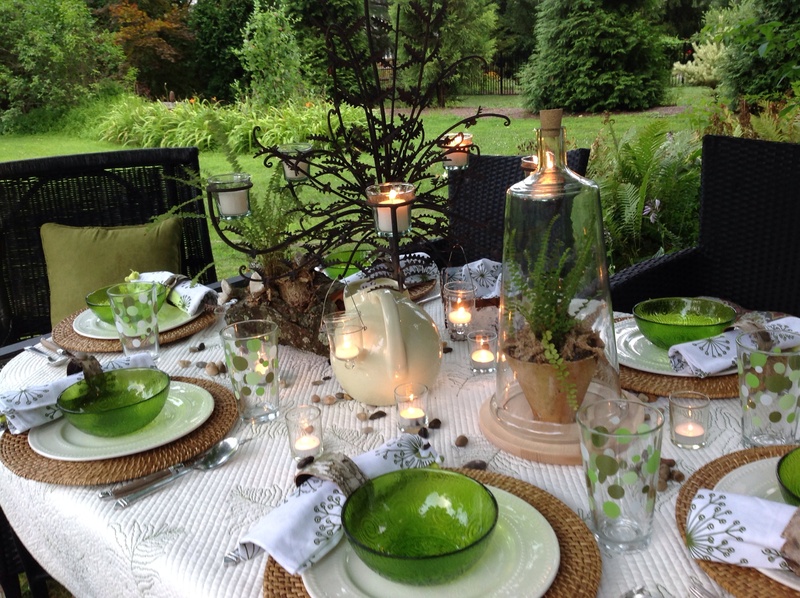 It is in this setting that I chose to set our outdoor dining table and create a woodland tablesetting with a fern theme. In the cherry tree vessel I set a fern, surrounded it with moss and nestled in 3 concrete mushrooms. I potted a second fern in a 1920s terra cotta pot with a lovely patina and set it under a vintage cloche, recently found in a new local boutique, Eastcote Lane. 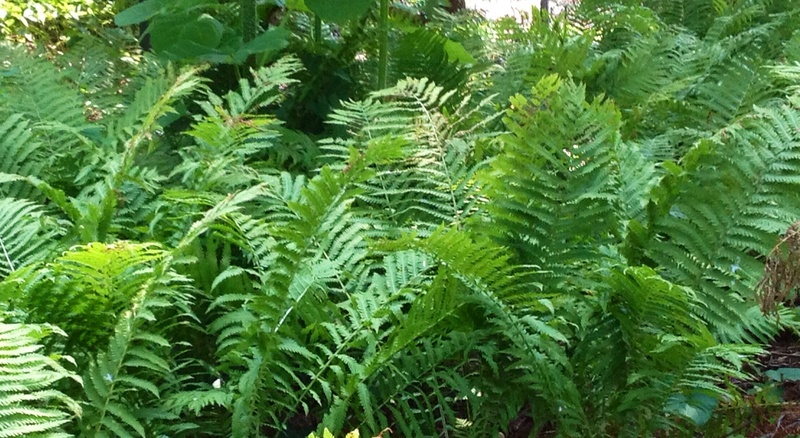 I placed these 2 naturalistic arrangements on a scalloped-edge fern motif quilt. A long-ago cherished fern candlelabra from the now defunct Smith Hawkins was hung by my son from a bough of a massive Sweet gum tree with a broad lush green canopy, under which we had set the table. This was the view, looking above, at dusk, of this superb tree canopy! I hung additional glass pendants from the candelabra for extra candlelight. 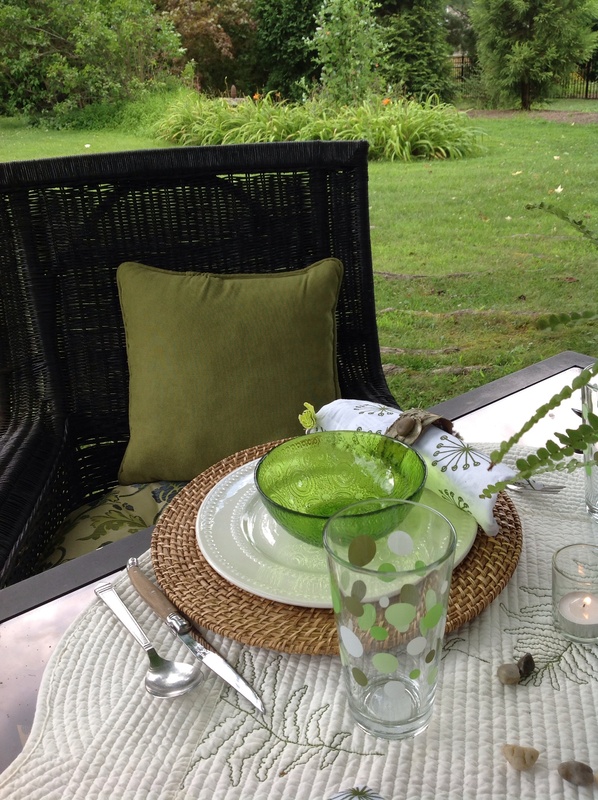 Place settings were kept simple and casual. 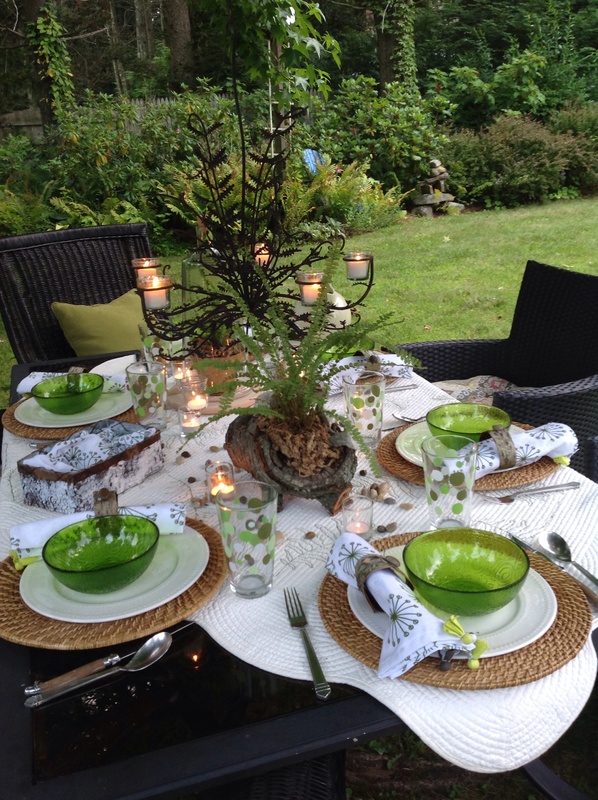 Rattan chargers were layered with cream stoneware dinner plates. The silverware was our everyday stainless steel flatware. 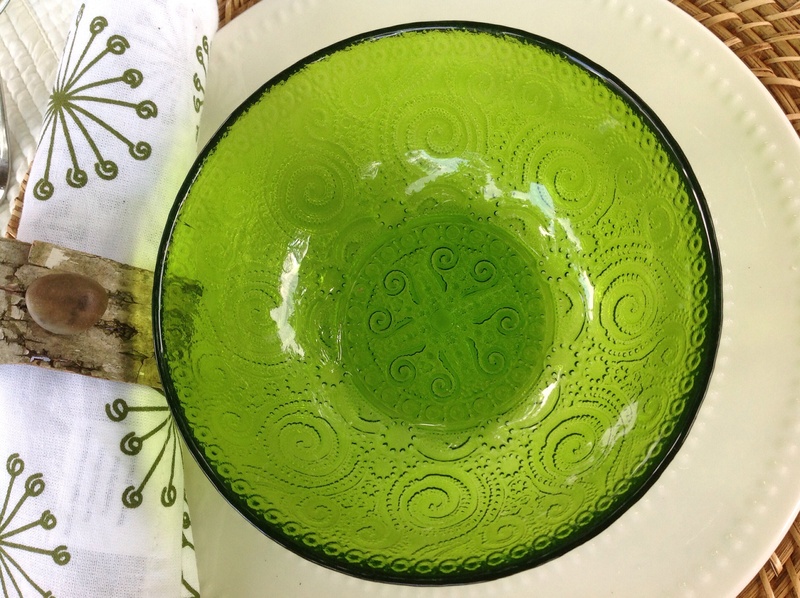 The green theme was highlighted by gorgeous handblown glass bowls from Turkey with an unfurling fern motif, scored at Home Goods. 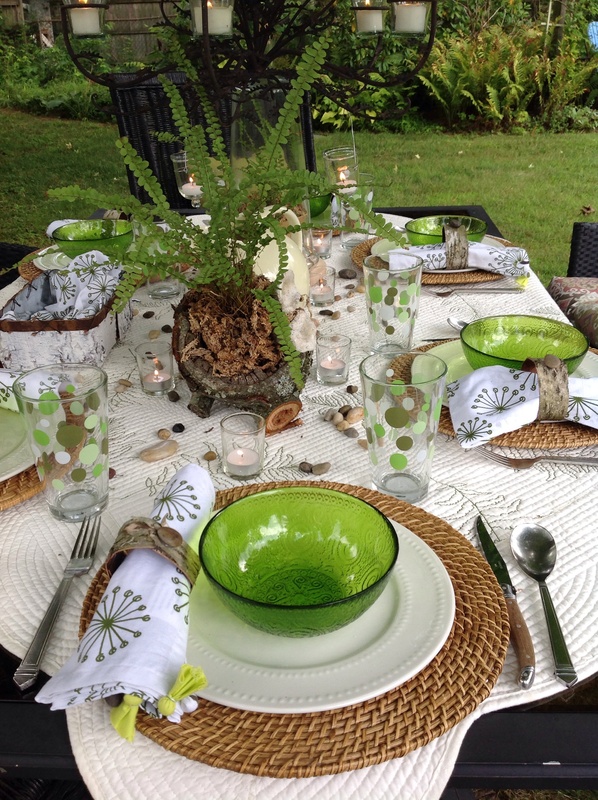 Green and white napkins with a botanical graphic print were simply rolled in DIY birch bark napkin rings. 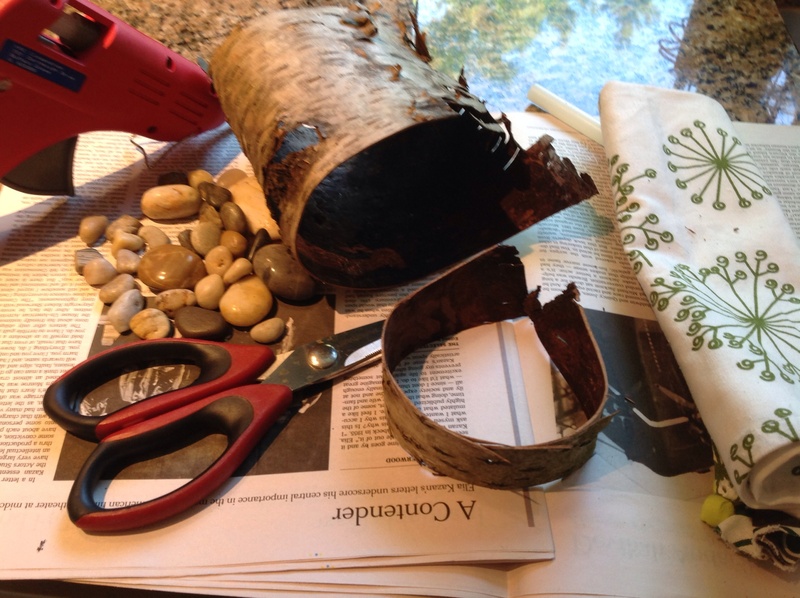 The napkin rings were made by cutting stips of birch bark with kitchen shears, shaping them into a ring, then glueing each with a dot of hot glue. 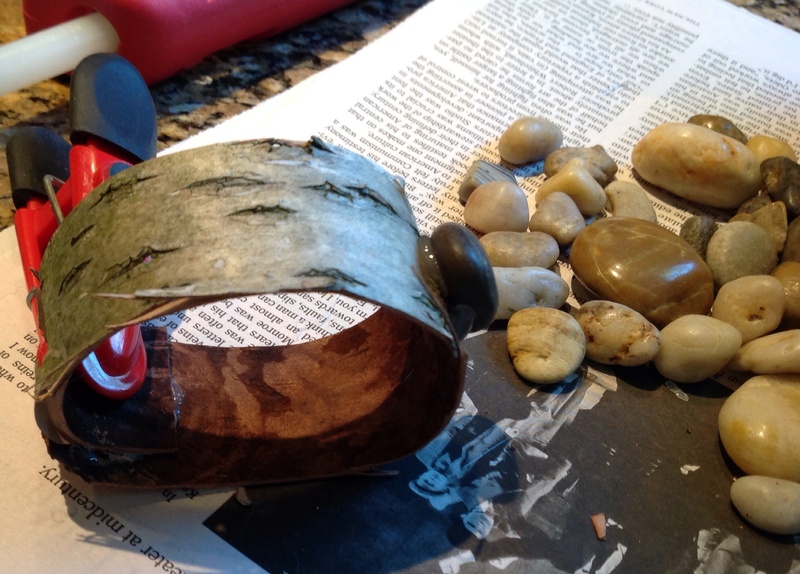 A pebble was glued on the top for a rustic finishing touch. 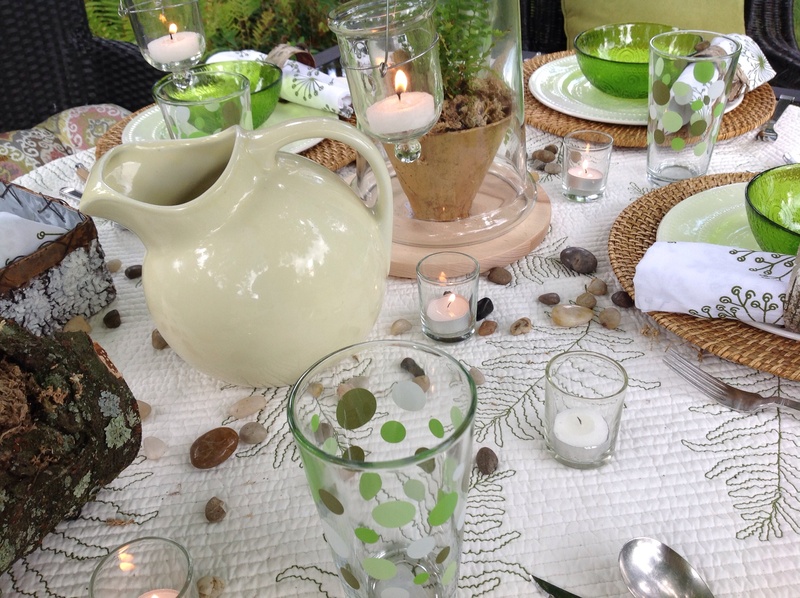 Tall glass tumblers with fun green and white polka dots were set out for water. A Fiesta Ware ceramic pitcher in pale green, dispensed water. A birchbark vessel meant for floral arrangements served as bread basket. 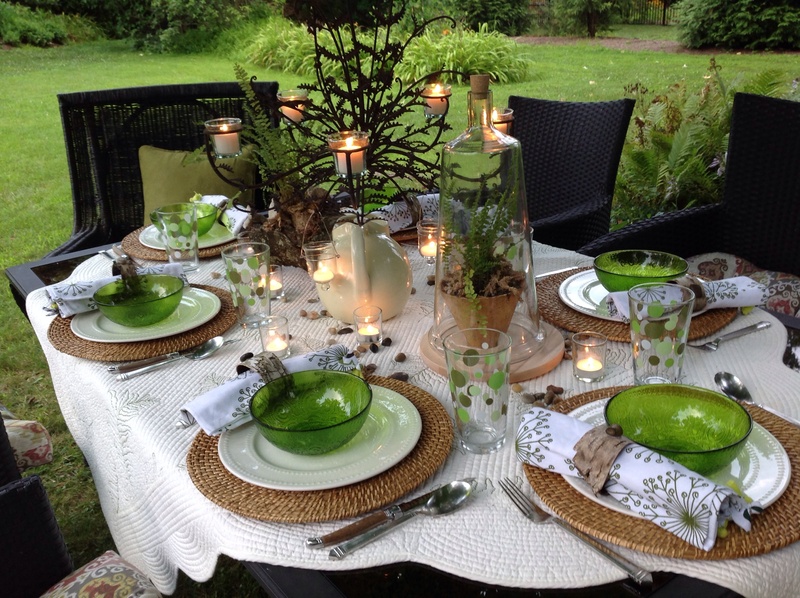 Additional pebbles were strewn all over the table top and a dozen white candles in clear glass votives dispersed more romantic candlelight to the table. Black wicker seating with comfortable cushions was chosen as black disappears in nature and becomes a neutral. 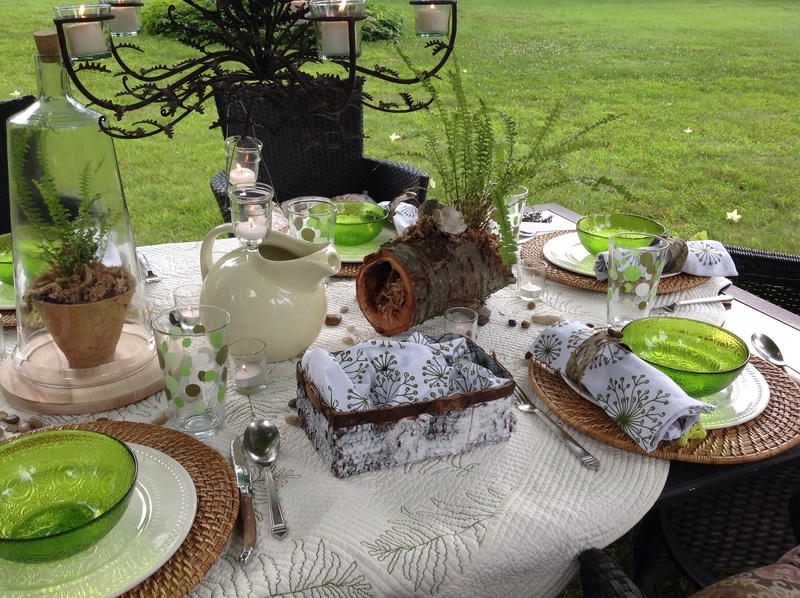 This way the table setting could really shine and beckon guests into a woodland moonlit settting for a magical evening under the stars. 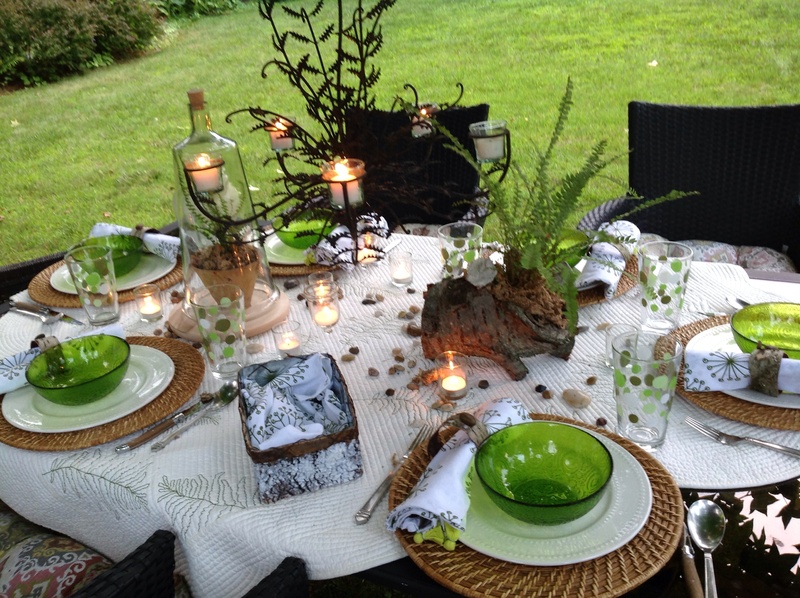 I hope to have inspired an outdoor table setting of your own creation! This post is dedicated to my son Tristan who inspired the post and did all the heavy lifting for me! 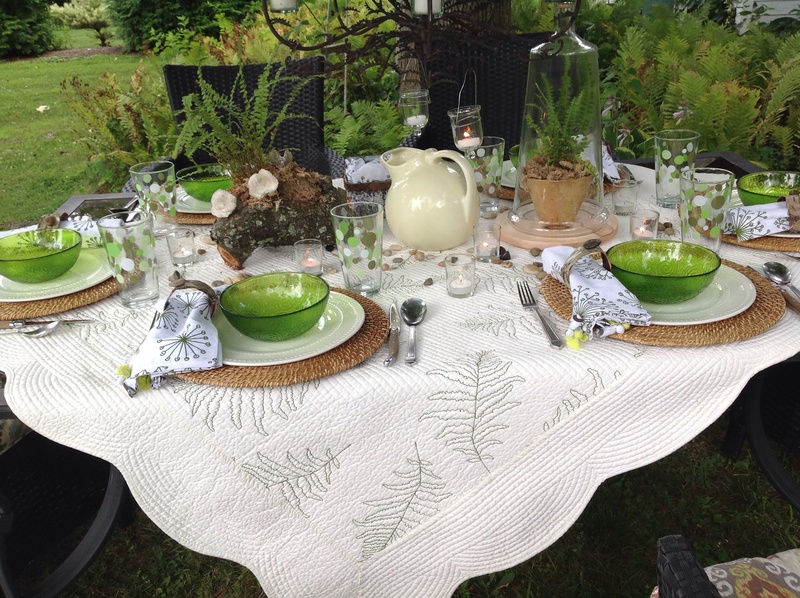 This entry was posted in Entertaining, Tablescapes and tagged DIY birchbark napkin rings, fern candlelabra, fern motif table under the stars, fern-themed tablescape, Woodland tablescape by Johanne Lamarche. Bookmark the permalink. Oh my, oh my, oh my!!! You have really gone and done it this time!!! This is beautiful! Absolutely gorgeous! What a wonderful backdrop! Nature really provides, doesn’t it? 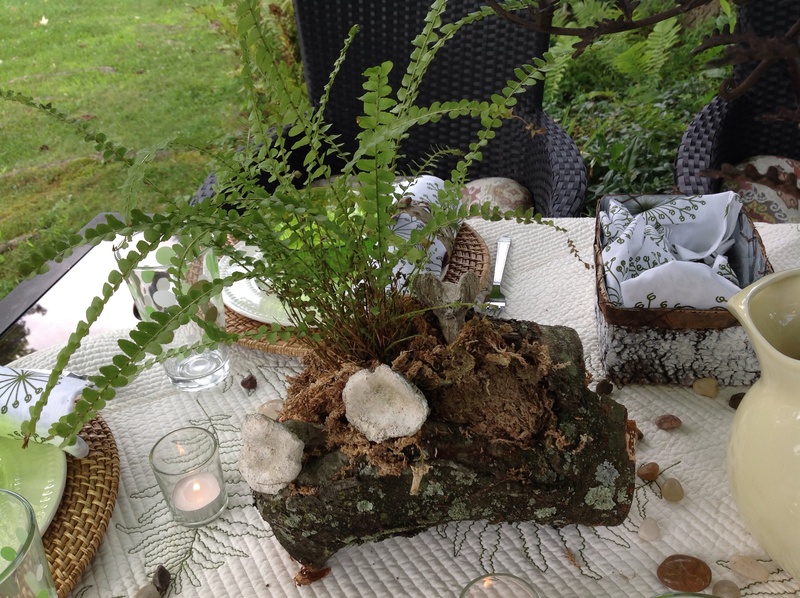 I am really impressed with the way you incorporated so much of nature into your tablescape through not only your choice of dishes, but by actually using natural tidbits here and there. And the use of the black wicker…yes, ma’am! You betcha!!! 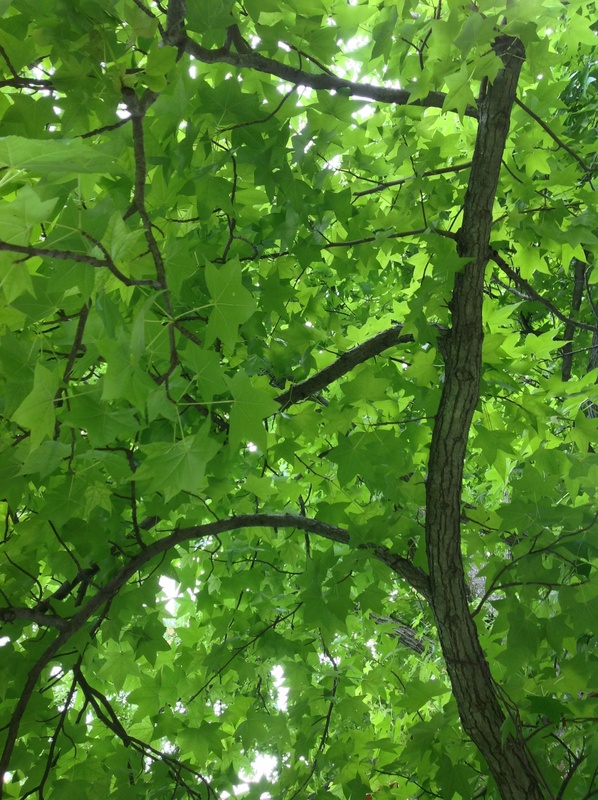 We have a beautiful sweet gum tree in our front yard which sits right outside my office window, and you are so right about the lovely canopy of shade it provides. Those are beautiful trees!!! I love it that you were able to have a chandelier hung ( a fern one, no less!!!) and other lighting. I know that just added to the overall magic! Exceptionally well done, Johanne! Lovely!!! Enjoy your weekend! You made my whole week Alycia! Thank you so much for your keen praise. Coming from you, it is a true honor! 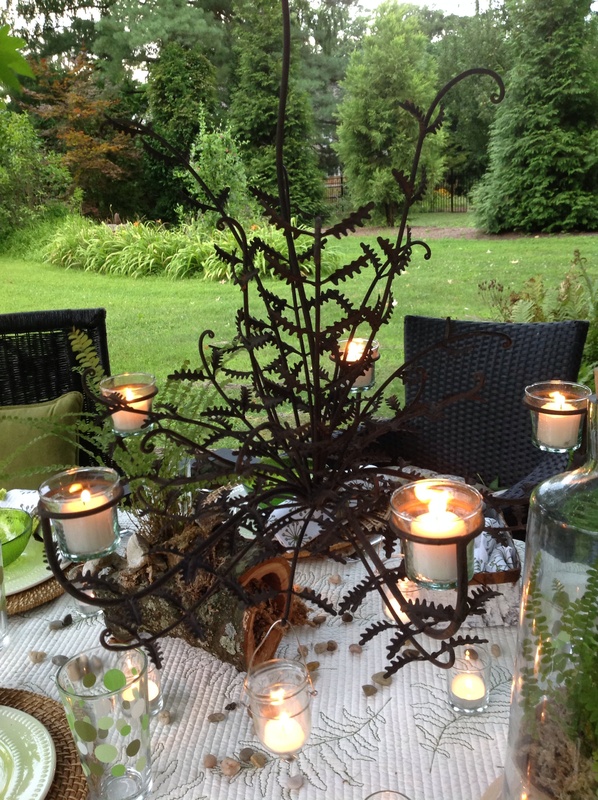 That fern candlelabra used to hang in our mountain cottage and I couldn’t part with it when we sold this home. It is mostly in storage but I love it and was so happy to use it here. The fen quilt used to be on our bed in that same cottage. I’m so happy my son suggested I use that hollowed branch for a floral arrangement. Long ago you asked what my blog’s focus would be. I think tying nature into everything I do is probably my signature! I am responding to your comment from northern Québec tonight, where I am on a road trip with my mom, visiting family. 🙂 Thank you for being part of my journey! 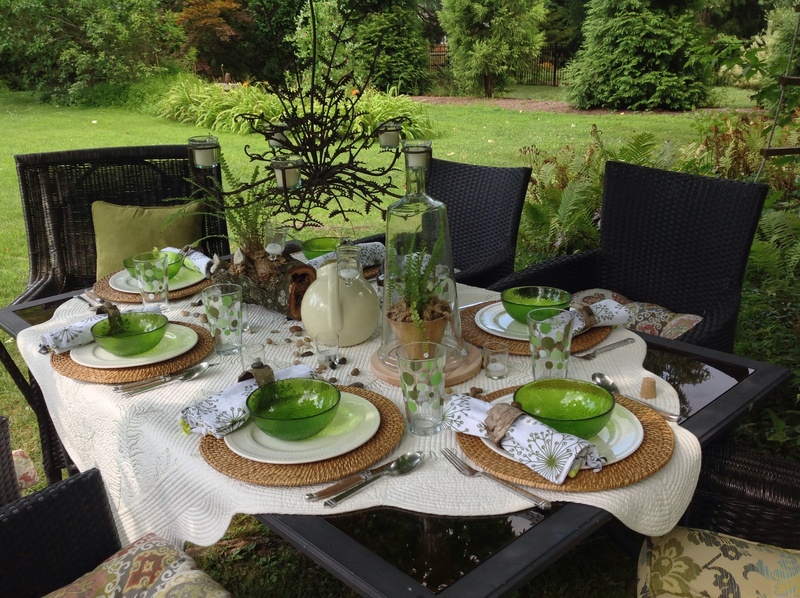 ….and I am looking for a Table Twenty One post under your sweet gum tree!